The Gombasecká Cave is situated in the Slovak Karst (Slovenský kras) in the northern slope of the Silicka Plain (Silická planina) in the administrative territory of the village Slavec. The cave was discovered in 1951 by a group of speleologists from the city Rožňava under the leadership of V. Rozložník. It was open to public in 1955 after some necessary adjustments. Out of its total explored length 1525 m, 235 m are open to public. 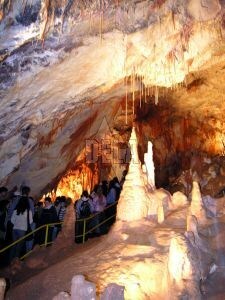 The cave is rich on stalactites and stalagmites, especially thin snow-white 3 m long ones which are in a strong contrast with a brown-red color of a limestone surface. Underground rooms of two stages were created by a Black Creek (Čierny potok) which flows from the Silicka Plain through the lower parts of the cave and ends under the cave entrance. Very suitable micro-climate conditions are convenient for the theoretical and practical research of airways illnesses.